Home » Blogs » Charles Gaba's blog » Me, 5/26: 6.4M. CMS today: 6.4M. I'd take a victory lap if the implication wasn't so grim. The overall average APTC Marketplace consumers received was $272 per month at the end of March 2015. 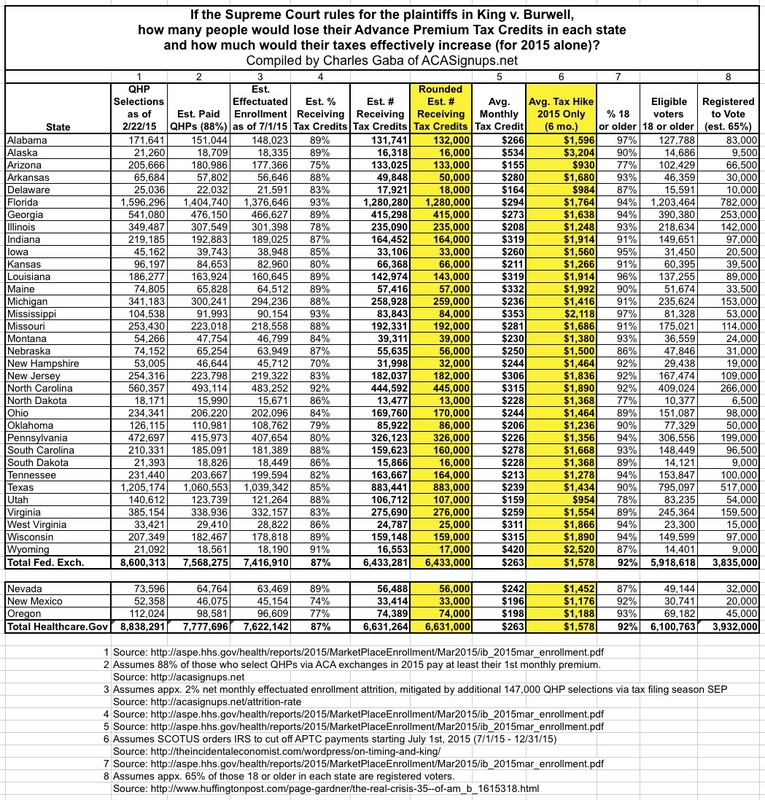 Because the amount of APTC an enrollee may receive depends on household income and the cost of the second lowest cost silver plan available to enrollees in his or her local area, the average APTC ranged from $536 per month in Alaska to $158 per month in Arizona. Of the 7.3 million consumers in the 34 states with Federally-facilitated Marketplaces, nearly 6.4 million or 87 percent received an advanced premium tax credit which averaged $272 to make their premiums more affordable in March 2015. The "good" news is that about 49,000 fewer people were enrolled in effectuated accounts in those 34 states as of March 31st than I thought (6,387,790 vs. my 6,433,000). The bad news (well, worse than it already was, anyway) is that the average credit those 6.4 million people are receiving is $9/month higher than I thought ($272 vs. $263). Anyway, I was off by about 0.7%. Then again, this only runs through the end of March. The actual number of people enrolled and receiving tax credits will be slightly higher or lower by the end of June, although it'll likely be pretty close to the March figure. This is significant, of course, because that's how many people will be directly screwed if the King v. Burwell plaintiffs win their case.